The final regular season event of the PGA Tour season is always tough. There are sweet stories like Shawn Stefani who birdied the final hole on Sunday at the Wyndham Championship to get inside the top 125 on the FedEx Cup points list and earn his PGA Tour card for the 2016-17 season. Then there are the stories of Matt Jones and Whee Kim. Both were inside the top 125 going into the Wyndham Championship, and both fell out after the event. Nos. 126-150 on the FedEx Cup list earn conditional status for next year (which is insufficient to really make hay on the Tour), and Nos. 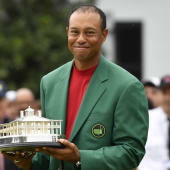 126-200 make it to the Web.com Tour Finals where 25 more players will earn their PGA Tour cards. Here are some big names who are in that group. Former major winners in that group including some promising and once-promising young stars. Golf is a cruel game, and these players have the FedEx Cup points finish to now prove it. Ogilvy and Cabrera can either earn their way back in the Web.com Finals or get sponsor exemptions next season. Other players like Hunter Mahan, Padraig Harrington and Ernie Els finished outside the top 125 but already qualified for their 2016-17 PGA Tour cards. A handful of players didn't finish in the top 125 in the FedEx Cup points race but got their cards because they finished in the top 125 on the money list which also gets them their cards for the 2016-17 season. And then there's poor Matt Jones. Matt Jones is double bubble boy. Finishes 126th in both FedEx and money list...needed either 9 more FedEx points or $5,168 to keep his card. All of this is a harsh reminder that not all of these players live like Rory McIlroy and Jordan Spieth. The tales of those like Stefani are the norm, not the exception. "I wasn't a great college player," said Stefani. "I had to earn my way the hard way, mini tours, 15 hour drives, driving across the country and, you know, it means more to me to keep my card than it does to some of the other guys who have won because I've gone the hard road for the game."